exhibited in the Woman's Building,1893 Exposition. Due to limited information online and on Japanese naming customs, I cannot determine whether or not there are three Atomi painters (perhaps two sisters and one cousin? ), but I think the one sometimes called Giokushi Atomi and at other times Tame Atomi are the same person, who was given the name of Katsuko Atomi at birth and was the daughter of a samurai of Shingo. 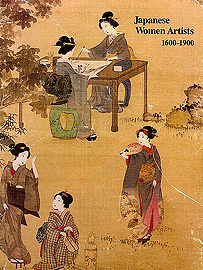 Giokushi Atomi was considered the "master of the cherry tree" in her paintings, and she established an important private art school for women. 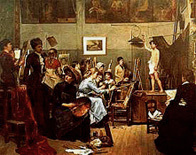 Atomi and her pupils broke with the tradition of students copying the paintings of the masters. Instead, they "painted from nature" and treated their nature paintings as philosophical/poetic experiences--an unconventional approach at that time. Atomi was also a published writer. Another Atomi (a cousin?) by the name of Kwakei Atomi also exhibited a painting called "Weeds and Flowers" in the Woman's Building at the 1893 Exposition. Shohin Noguchi was born to a physician's family in Tokushima Prefecture in Osaka and given the name of Chikako. 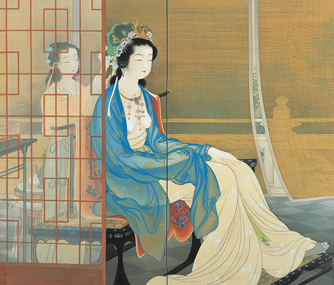 She began studying painting before reaching her teens and became head of the household at age sixteen when her father died and she had to support her mother while she studied "bird and flower" and landscape painting with the Kyoto scholarly painter Hine Taizan. Along with Seiko Okuhara, Shohin is considered one of the best Nanga painters during the Meiji era and she became a celebrity. She also taught at the Peeress' School (currently Gakushuin Women’s College) and was appointed official artist of the Imperial Household. Tsune Uemura became an important woman artist in the Meiji, Taishō and early Shōwa period of Japanese painting who signed her paintings with the "art name" Shōen Uemura. 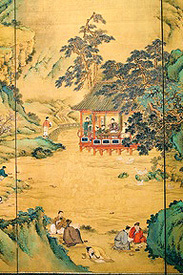 Her parents ran a small tea shop, but her father died when she was very young. Her formal art training began at age 12 at the Kyoto Prefectural Art School with Suzuki Shōnen, a landscape painter who sexually harassed her and by whom she evidently became pregnant several times. 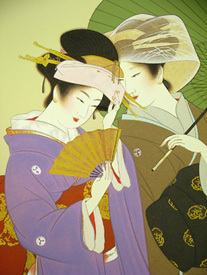 Her later teachers, Kono Bairei and Takeuchi Seifu, were both masters of the nihonga Japanese style painting. 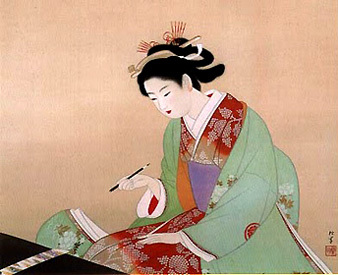 She often painted female characters from Noh theatre and helped expand the Japanese genre of "Bijinga" (pictures of beautiful women) by focusing on women's activities rather than on women just as objects of male desire. After a long successful career, she became in 1941 the first woman painter in Japan to be invited to join the Imperial Art Academy and in 1948 the first woman to be awarded Japan's prestigious Order of Culture. Her autobiography is titled Seibisho.